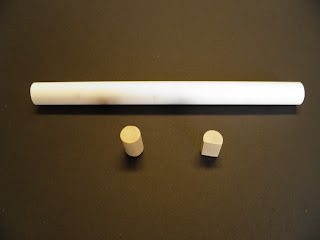 The first step is to make a flat on the lower dowel plug. 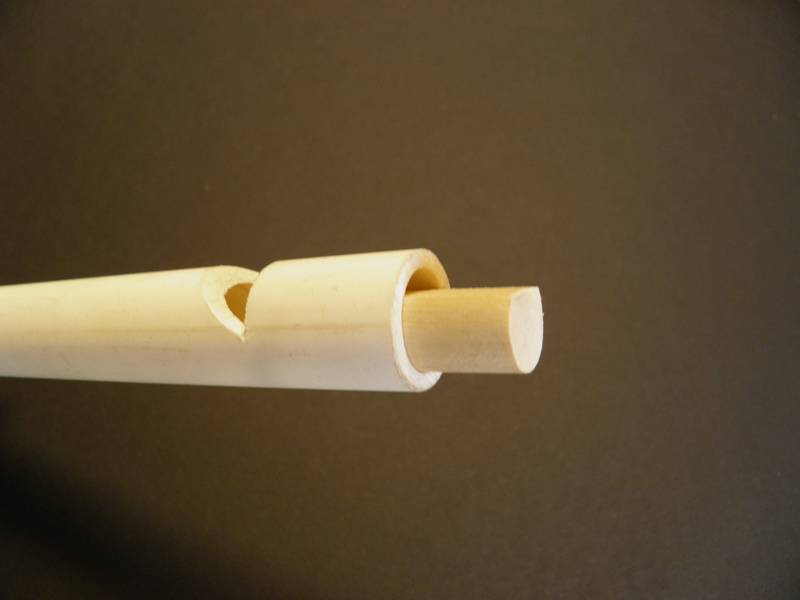 You can do this either by cutting into the end of a long dowel with a saw (at about 1/3 the diameter) then cutting off the two slices about 1'' long, or cutting off a section of dowel about 1'' long and slitting it with a chisel and hammer to create the flat. The next step is to cut out the mouth of the whistle, cutting a little less than half way into the diameter and then in at a 30 to 45 degree angle to remove the slice. Insert the dowel with the slice taken out of it into the lower side of the whistle so the flat faces the mouth of the whistle. The top of the dowel should be level with the bottom lip of the mouth for the best sound. 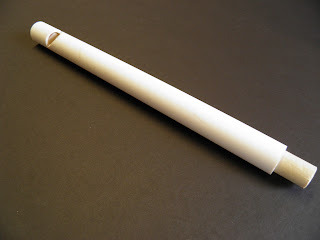 Note that pvc and dowels are not all that consistent in diameter so you might have to add some masking tape to the rounded side of the plug to keep it from falling out. Cut your pipe to a little longer than the desired length measuring from the top of the bottom plug and add the upper dowel to complete the whistle. If you want to be really precise the length of the plug in the tube should equal the extra length you added to the whistle pipe. The specific tone of the whistle is determined by the interior height of the tube (the length from the top to the bottom plug). While the whistle's length determines the natural frequency it wants to play, over blowing the whistle can cause the tone to shift upwards to a quieter breathy sounding overtone. A simple a approximation for tone is F= V/4L, the frequency (F) will equal the speed of sound (V) over 4 times the length of your whistle tube (L), as closed tubes tend to resonate with a quarter wave length. To simplify things we tend to reference the length/pitch table used for palm pipes. For the full set of equations see this wikipedia article on acoustic resonance. 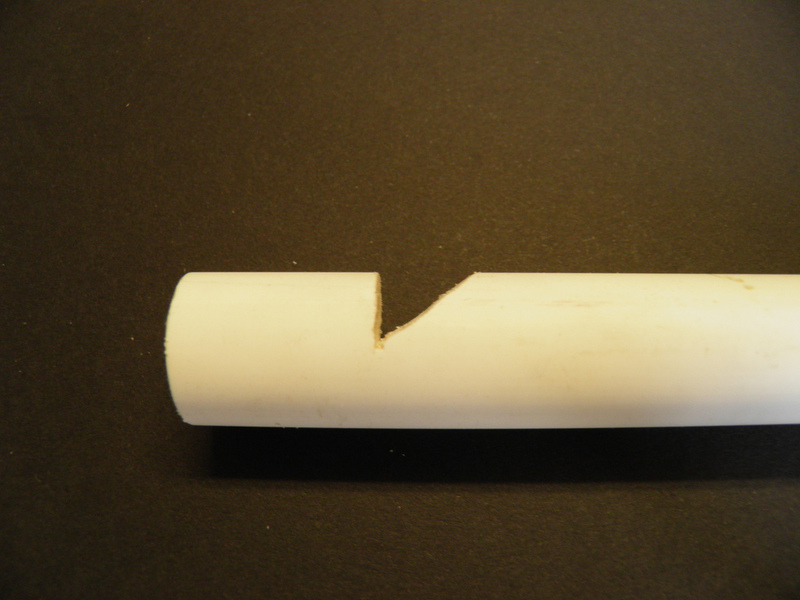 Note that if you get much over 8'' you'll have to switch from 1/2'' pvc to 3/4 or 1'' to prevent immediate overblowing. A good overview of whistle engineering can be found at this site. The author provides several optimal ratios (length to diameter and mouth size to whistle diameter) for making a loud and consistent whistle. Playing with our own whistles we found his numbers to be a bit conservative, though the whistles with a length to diameter ration of 3:1 are loud and do not over blow easily, you can stretch this ratio to about 16:1 for low notes with small pipes and get away with it. The drawback is of course they can over blow more easily. Here's a Multi tone (chime) steam whistle cleverly put together using pvc elbows and tee fittings. Note a variable pitch slide whistle version will be coming soon.